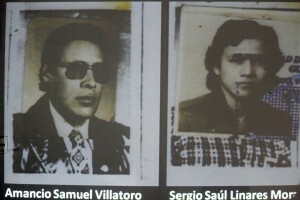 I spoke with Samuel Villatoro, the son of Amancio Samuel Villatoro, the labor leader who was a victim of Diario Militar. I found him to be a modern young man, hard-working, professional, a father and husband, a possible road to reconciliation from the experience of a family. Monday, January 30, 2012 was the 28th anniversary of the forced disappearance of the founder of the Union of Chiclets Adam’s, he was the union’s consultant and maximum leader of the National Workers Central (CNT), a member of the National Committee of Labor Unity (CNUS) and a member of the Rebel Armed Forces (FAR). His sons, Nestor and Samuel, remember him as a humanist, willing to struggle for his neighbor, to do something for the rest, especially for the weak, as long as it was for the purpose of improving the conditions of the people, and not to profit from it, regardless of the profession. That morning, at the headquarters of the Guatemalan Foundation of Forensic Anthropology (FAFG), in front of media, human rights activists from abroad and nationally, ex combatants, students, workers, labor activists, civil organizations, in front of the people; the FAFG and the Amancio Samuel Villatoro Foundation, led by his sons Samuel and Nestor, inaugurated for all society the Museum of the Martyrs of the Labor, Student and Popular Movement of Guatemala. Speeches. I was struck when I saw and heard Helen Mack, who reached the podium crying the historic morning. “I believe that reconciliation comes from what we did or stopped doing”, she said, proposing a profound self-criticism of the social movement, rescuing not only the memory of the fallen, but also that of the very resistance, without romanticisms or apologies. It was difficult talking with Nestor Villatoro. He told me: “It was difficult to make my father’s family understand, due to the conservative tradition, it has been difficult, I’ve managed to make them understand…” – When I asked him how the idea of the museum emerged – “To rescue the historic memory of the more than 45 thousand martyrs”- Nestor answered. Like his father he is a labor leader, he lives in the US, where he fled due to threats to his life. He first went to Mexico and then illegally to the US. He came for this event and today he is a member of the National Nurses United, one of the biggest unions in the country he affirmed. He and Samuel dream big. They are initiating a legislative proposal so that the Museum of the Historic memory becomes a part of the educational programs of the Department of Education. And they hope to someday create a National Museum-Cemetery of the armed conflict. Soon, they will accompany with psychological help families of the victims of the conflict like themselves y carry out trips of medical assistance, beginning in a significant community: Nebaj. This phrase, often repeated, acquired a new meaning for me after this experience. “For me it has been a healing experience”…Samuel told me, two days later on the morning he was supposed to open the Museum to the public. “Away from the cameras and just (…) with his simple presence (the remains of his father), I feel comforted.” He verbalized the tornado which inhabited within in those hours and what his family lives. During these years, each person cried by alone, but now they cry together. To return to his country as he did to make his living, before his adolescence; the silence and the fear dominated their days, those of his mother and sister and other brother, today an orthopedist. They did not speak, they were still afraid, despite the years, they were fearful in all parts, in the shopping center, etc. It is a language which is typical of the petty bourgeois middle class which readers understand. His mother and sister resist exhibition. Nestor and he need it, while his other brother is neutral. A cycle is truly broken here. One of silence, fear, of the anguish of not knowing where and how. There will be mourning in a man, in his family. The Villatoro family today reproduces the GREAT AND PROFOUND NEED of all families of Guatemala. The family is the nucleus of society. The Villatoros are showing the road to follow to all with their uncertain walk… “We have not stopped, we have continued forward, this is just a part of your life which you cannot forget,” he affirmed referring to “the social logic of forgetting as a way of life, to the lie that to remember is to remain in the past. “Every person who died for his country is a martyr,” he emphasized. He wanted to make it clear that it was not a space for hate, for leftists only, that all are welcome there. “Bring them,” he invited those who wish to bring the remains or objects of the other side, he assured me. That “they” acknowledge and “we” also in order to forgive each other. The country of the injustice created a LIE: peace will be attained by forgetting or by negation. But the lesson is another: it will be with MEMORY AND TRUTH. A structured interview with Néstor Villatoro on January 30, 2012 at the Museum for the Martyrs of the Labor, Student and Popular Movement of Guatemala, made on 1ª Calle 1-53 Zona 2, Ciudad de Guatemala at approximately noon. A structured interview with Samuel Villatoro, Director of the Amancio Samuel Villatoro Foundation on February 2, 2012 in the office of the Guatemalan Anthropological and Forensic Foundation on 1ª Calle 1-53 Zona 2, Ciudad de Guatemala at 10:00 AM. My memory of the events during the inauguration of the Museum for the Martyrs of the Labor, Student and Popular Movement of Guatemala initiated by the Guatemalan Anthropological and Forensic Foundation on January 30, 2012. ← Women resist crisis and war! Fight for national and social liberation!